Patient Room Systems: Tortuous Lid Design Limits Access To Container Contents And Facilitates One-Handed Operation. Horizontal Drop Design For Maximum Capacity To Fill Line And Large Openings Accommodate Larger Syringes. 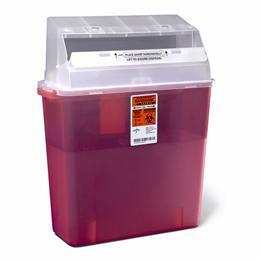 The Translucent Lid Provides Easy-To-See Fill Levels. Containers Easily Lock For Final Disposal And Safe Transport. The Nestable Design Saves Money On Shipping Costs And Storage Space. 3 Gallon, Wall Mount/Freestand.